Yoel Camacho - Recipient - The Eye-Bank for Sight Restoration, Inc.
Luckily, at age twenty-four, Yoel Camacho was able to pursue a career as a New York City police officer, something he could never have imagined just two years prior because he was legally blind. 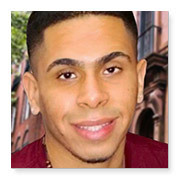 Originally from the Dominican Republic, Yoel came to the US with his family when he was eight years old. He admits to always having had trouble with his eyesight which posed challenges at school including, not being able to recognize his friends because he could not see their faces. When Yoel was 15 years old he was diagnosed with keratoconus, a progressive eye disease that causes the cornea to become cone shaped. After wearing hard contact lenses for two years Yoel received a cornea transplant to his left eye which was in a worse state than his right. After the surgery, he was elated to see the letters on the eye chart and best of all, his friends’ faces! Four years after his first cornea transplant Yoel received a successful transplant to his right eye and was so ecstatic with what he could now see that he shouted, “The world is wonderful!” Yoel’s vision is now 20/20 and with his restored eyesight was able to pass the entrance exam for the New York City Police Department and enroll in Monroe College to study Criminal Justice. He says that he will be ever grateful to the donors who said “Yes” to donation and made his cornea transplant surgeries and restored eyesight possible.